sound pressures and sound intensities with the absolutely necessary measuring of the distance. From these we can see that the decibel scale gives numbers in a much more manageable range. Sound pressure levels are measured without weighting filters. Avoid using the psychoacoustical terms loudness perception and volume. This subjective sound-sensation is not clearly measurable without ambiguity. acoustics and this personal feeling is not correct definable. same loudness perception by all individuals (people). "loudness level" with the unit phon and the "loudness" with the unit sone. extra announcement. The amplitude of the sound pressure means the peak value. The sound pressure (RMS) is the most important quantity in sound measurement. pressure of 101 325 Pascal (mean atmospheric pressure). The sound is the change of sound pressure p, which is measured in pascal. 1 Pa ≡ N/m2 ≡ 1 J / m3 ≡ 1 kg / (m·s2). Usually p is the RMS value. Wrong question: "Jackhammer. How many dBs?" The distance is missing! Notice: A given sound level without a given distance is really useless. A typical question: How "loud" is 15 dB? Is there a distance from the source? The auditory threshold is used as the reference sound pressure p0 = 20 µPa = 2 × 10−5 Pa. The threshold of hearing corresponds to the sound pressure level Lp = 0 dB at f = 1 kHz. The auditory threshold is calculated as the reference sound intensity I0 = 10−12 W/m2. The threshold of hearing corresponds also to the sound intensity level LW = 0 dB at f = 1 kHz. level or sound intensity level is meant. "sound level" simply of "sound pressure level" (SPL) as sound field quantity. "sound level" probably "sound intensity level" as sound energy quantity. Equating sound pressure with sound intensity must cause problems. I ~ p2. the place of measurement, possibly one ear of a listener. fixed dB value; e.g. jackhammer = 110 dB and jet plane = 130 dB. Distance ??? No distance, then forget the decibel value! sensitivity of the tested person, is to find between 120 dB and 140 dB. There is no noise decrease or sound drop per meter. We get a sound level drop of 6 dB per doubling of distance. to do with the distance from the sound source. all the time. Watts don't change with distance. What is loud? Noise is a sound that disturbs or harms. barks" and "noise is the sound of the others." What is the highest sound pressure possible? How many decibels is the loudest noise? L = 20 × log (101 325 / 0.000 02) = 194 dB SPL. Pay attention, RMS value is not peak value. explosion. No hearing protection (ear muffs or ear plugs) can help you there. Ultrasound between 20 kHz and 1.5 GHz does not belong to our human hearing. are connected to the sound source and are independent of distance. Sound pressure levels vary substantially with distance from the source. same physical size as intensity J or I in watts per square meter. distance r from the sound source - neither with 1 / r nor as 1 / r2. choose a reference sound characteristic impedance of Z0 = 400 N·s/m³. This is not the case with the distance independent sound power level. Source of disturbance - Musical instrument? Sound power (German)? There is no "dBA" value given as threshold of human hearing. These values are not given as dBA, but as dBSPL, that means without any weighting filter. The sound pressure level decreases in the free field with 6 dB per distance doubling. That is the 1/r law. (inverse square law). That's wrong. microphone to the source. p ~ 1/r. How does the sound decrease with increasing distance? Note: The often used term "intensity of sound pressure" is not correct. Use "magnitude", "strength", "amplitude", or "level" instead. equivalent to pressure (sound field size). surface area A in m2 perpendicular to the direction of the sound. The SI-unit for the sound pressure p is N/m2 = Pa. p ~ 1/r. How to measure sound pressure? By the way, sellers always want us to buy a sound pressure level meter with digital display. But much better, however, is an analogue-to-read display - as in this figure. values to sound pressure level dBSPL or vice versa. That is only possible measuring one single frequency. There is no "dBA" curve given as threshold of human hearing. "hide" nasty hum components that make for bad noise specs. Readings of a pure 1 kHz tone should be identical, whether weighted or not. are showing always too low measured values. There is no formula for calculating "equal loudness"
values to sound pressure level dBC or dBSPL. Also no dBC measured values can be converted to dBA values. The frequency composition of the signal is not known. mentioned dB value. But they are not interested on the important distance from the noise source. That shows that they are just "dummies". How loud is a siren? The closer you get with ears to the sound source, the louder it will be. room volume was determined by the courts. Noise is always the produced annoying noise of others. There is no objective judicially accepted definition of a sound level in decibels of low volume basis. Rated sound is not specified in phones, but increasingly in dB (A). this information is worthless. This unfortunately happens quite often. 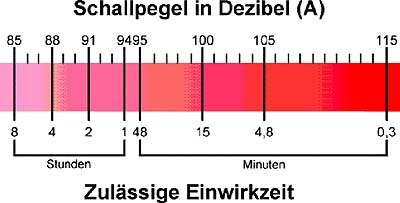 The sound power level in dB ist not the sound pressure level (SPL) or the sound intensity level! This information is often not understood or seems to be confusing. From a dB-A measurement no accurate description of the expected noise volume is possible. What is the pain threshold? The point at which pain begins to be felt. the ear as painful. Because of the different sensitivity of people it cannot be given an accurate value. weighted average noise, according to NIOSH-AINSI and CDC. in half − before damage to our hearing can occur. rate, to determine the noise dose. rate, which does not protect many workers from hearing loss over their whole working lifetime. This may not represent a worldwide view of the subject. performance reduction, annoyance responses, and adverse social behaviour. structure, sound level, information content and subjective mental attitude. rate, which does not protect many workers from hearing loss over their working lifetime. may depend on the different perspective of the employer and the employee. Noise protection always costs money. ca. 250 ms sound smearing / quasi-stationary processes. Note: Which increase corresponds to a doubling of the sound (factor = 2)? An increase of the sound level by 3 dB corresponds to a doubling of sound intensity. An increase of the sound level by 6 dB corresponds to a doubling of the sound pressure. An increase in the sound level by 10 dB corresponds to the sensation of double the "volume". the violins, or 60 violins to double the psychoacoustic volume (loudness). How many decibels (dB) change is double, half, or four times as loud? How many dB to appear twice as loud (two times)? Here are all the different ratios. Ratio means "how many times" or "how much" ... Doubling of loudness. The psycho-acoustic volume or loudness is a subjective sensation size. Is a 10 dB or 6 dB sound level change for a doubling or halving of the loudness (volume) correct? loudness from quiet to loud is stronger than from loud to quiet. hence does not represent a fundamental relation between stimulus and sensation. to a level change approximately between 6 dB and 10 dB. Question: What is the standard distance to measure sound pressure level away from equipment? sound source and the sound pressure level. are even set equal. But I ~ p2. The sound power does not decrease (drop) with distance from the sound source." (!) to do with the distance from the sound source. the same 100 watts, which is emitted from the lamp all the time. Watts don't change with distance. A frequent question: "Does the sound power depend on distance?" The clear answer is: "No, not really." (sound pressure) and the vector quantity v (sound velocity) as a sound field quantity. where the sound engineer is particularly interested in the effect. Sound pressure and Sound power – Effect and Cause. designer (ear people) you don't need that sound energy quantity. and as a 10 times logarithm of a ratio of quadratic sizes to each other. is referred to as ratios (factors), such as reflection factor. measures such as transfer factor, or level, such as sound pressure level. Levels are measured in decibels - dB in short. of the initial output voltage. This applies to all field sizes; e.g. sound pressure. of the initial output power. This applies to all energy sizes; e.g. sound intensity. In point-like sound sources spherical areas A shall be inserted. A typical question: "What is the dB volume of a symphony orchestra?" Answer: "It really depends on the distance from the listener to the orchestra." number. But only a dB number is really senseless. "How many decibels (dB) are doubling a sound"? or "What is twice the sound?" Answer: Doubling means the "factor 2". What does doubling of a "sound" mean? Doubling the (sound) intensity is obtained by an increase of the sound intensity level of 3 dB. Doubling the loudness feeling is obtained by an increase of the loudness level of about 10 dB. Double or twice the power = factor 2 means 3 dB more calculated power level (sound intensity level). Double or twice the loudness = factor 2 means 10 dB more sensed loudness level (psycho acoustic). working with voltage or current, 6 dB means double (twice) the factor and 20 dB means 10-fold. "8 Ohm Output" and "150 Ohm Input" − What is that?